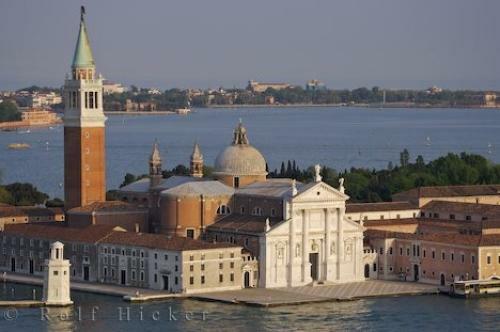 The Campanile view of the white face of the church of San Giorgio Maggiore on the island of the same name in the city of Venice, Veneto in Italy, Europe. Across from the Piazza San Marco, the Basilica di San Marco and the Campanile di San Marco in Venice, Italy, is the island of San Giorgio Maggiore where you will find the church of San Giorgio Maggiore. There has always been a church on the island since the 8th century, and in the 10th century a Benedictine monastery was built. In the late 15th century the present church was began and the campanile was constructed in 1791. A visit to the top of the Campanile di San Marco will give a wonderful view of Venice, Italy and the roof of the Basilica di San Marco. Campanile di San Marco view of the island, church and campanile of San Giorgio Maggiore in Venice, Veneto in Italy, Europe. This just goes to accentuate the belief of Andrea Palladio, the architect who designed the church, who said that white was the colour most pleasing to God. San Giorgio Maggiore seen from the Campanile in the Piazza San Marco in Venice, Veneto, Italy, Europe. I photographed this photo with the digital SLR camera model Canon EOS-1Ds Mark II, aperture of f/6.3, exposure time of 1/160 sec. on ISO 100, as always I used a original Canon Lens, the focus lenght for this picture was 160mm.